Children's Shoes and Orthotics | Podiatry Associates, P.C. Let’s face it, kids grow fast! It might seem like you’re playing “this little piggy” with your infant one moment, and in the next you’re buying shoes for the first day of school. Then before you know it, the senior prom! Certainly, every parent wants to protect their children’s feet as they grow, and the best way to do that – besides regular podiatry visits, of course – is to invest in good shoes, and sometimes a little help from orthotics. Take your child with you, and plan on going at the end of the day when feet have naturally swollen a bit. Measure your child’s feet every time (since kids’ shoe sizes can change rapidly). Also, be sure to size both feet as it is not uncommon for one foot to be slightly larger than the other – and then always fit for the larger foot. Make sure there is plenty of wiggle room for toes, and that you can fit the width of your thumb between the longest toe and the top of the shoe. Have your child walk around and take shoes for a “test drive” before purchasing – they should be comfortable right off the bat. There is no such thing as “breaking in” shoes! Check that the heel counter is not too snug nor too loose so it does not place pressure on the heel or slide up and down. Fold the shoe to ensure it bends where your child’s foot naturally does, and make sure the sole is flexible yet durable. Wearing appropriate shoes that fit well is typically enough to protect kids’ feet as they grow and are active, however, sometimes children’s feet may need additional help to stay safe and healthy – that’s where children’s orthotics come in to play. Children with certain conditions or with structural or biomechanical abnormalities can benefit from orthotic inserts. These devices fit right inside your child’s shoes and can help disperse weight evenly, provide additional support and cushion where needed, and keep feet in correct alignment, reducing discomfort as well as risk of injury. Children with flat feet who never develop an arch, babies with clubfoot, and kids who walk pigeon-toed are a few examples of situations when orthotics may be helpful. We will assess your child’s feet to determine if orthotics could be beneficial. If so, we will custom make the inserts to fit your child’s unique feet and address his or her specific needs. Like shoes, it’s important that orthotics fit properly, and will need to be adjusted and replaced as your child grows. Remember -- investing in proper footwear, and in some cases, orthotics, will protect your child’s feet from pre-school to prom! Contact us if you would like more information or if you wish to schedule an appointment for your child. 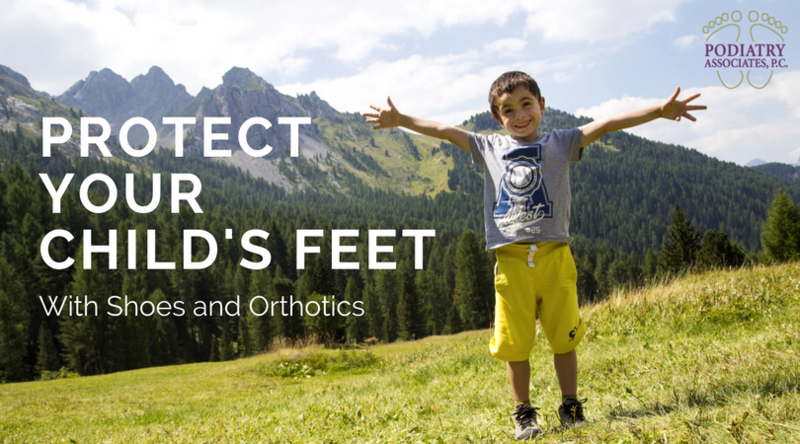 Call (303) 805-5156 or use our online contact form to reach us and we’ll be happy to help you protect your child from painful foot conditions and injury!